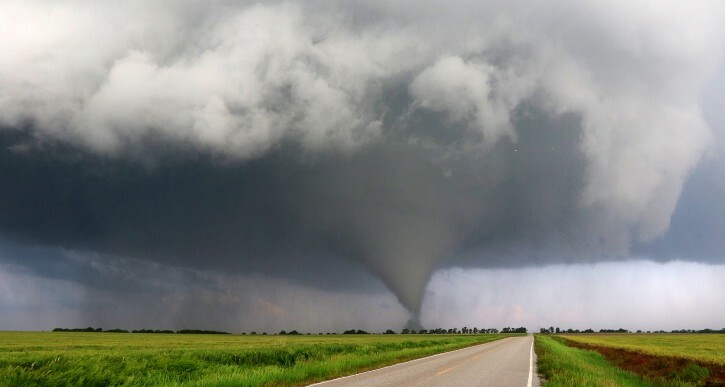 Kansas, Ok - A tornado that raked the northern Kansas landscape for about 90 minutes was impressive both for its classic “wedge” shape and its sheer endurance — staying on the ground about 10 times longer than the typical twister. The Storm Prediction Center says most tornadoes last less than 10 minutes and stay on the ground for about 3½ miles. Wednesday’s storm covered about 23 miles between Niles and Chapman, but was moving so slowly it lasted an hour and a half and was so isolated that other storms never interrupted its air flow. The SPC says the legendary, long-lived tornadoes talked about from a century ago were most likely a series of storms along one general path. The twister that hit Kansas tracked eastward at about 15 mph. The slow forward motion gave forecasters plenty of time to warn people living in the area to either get out of the storm’s way or take shelter. The National Weather Service at Topeka warned Chapman’s 1,400 residents at 8:06 p.m. Wednesday that the storm was 4 miles west. With the storm moving at 15 mph, that gave people 16 minutes to prepare. There have been no reports of injuries or deaths. Tornadoes are usually part of weather systems that form multiple storms — one with hail here, high winds there. Cold air flowing out of those other storms often chokes off the balance a storm needs to keep a tornado going, said Erik Rasmussen, a research scientist at the University of Oklahoma and the project director for Vortex Southeast. “The things that end up destroying a tornado didn’t happen,” Rasmussen said. “It was really just bad luck.” The next-nearest storm capable of influencing the Chapman twister was south of Wichita, Kansas, 120 miles to the south. Tornadoes — and on a larger scale, hurricanes — are the most efficient way to move air from one part of the atmosphere to another. Typically in the U.S., tornadoes form when moist, warm air from the Gulf moves northward on air currents to meet drier, cooler air moving in from the Pacific or Canada. Warm air rises and cool air falls. When air masses collide, physics dictates how to achieve a balance in the atmosphere. Sometimes that involves tornadoes, sometimes it doesn’t. The triggering mechanism isn’t fully known, which is why meteorology remains a science. Most often, tornadoes die after 10 minutes or less, but if the intake and outflow are balanced they can continue for an hour or more, as on Wednesday. Rasmussen said tornadoes that endure for so long are extraordinary. “I’m sure less than 1 percent of tornadoes last 90 minutes or more. There’s probably only two or three a year,” Rasmussen said. The U.S. sees an average of about 1,200 tornadoes a year. For a common comparison, consider how a bathtub drains. More water in the tub means the funnel will last longer. Being on the ground a long time does not necessarily make a storm a killer, and being on the ground a short time doesn’t make a storm insignificant. Wednesday’s storm, and another earlier this week near Dodge City, Kansas, were in sparsely populated areas. The Joplin, Missouri, storm that killed 158 people five years ago was on the ground for 6 miles; a storm that killed 24, including seven school children, at Moore, Oklahoma, in 2013 was on the ground for 14 miles. A Super Tuesday storm in 2008 was on the ground in Arkansas for about two hours — a half-hour longer than Wednesday’s twister — but moved faster and was deadlier across rugged terrain. It covered 122 miles and killed 13.